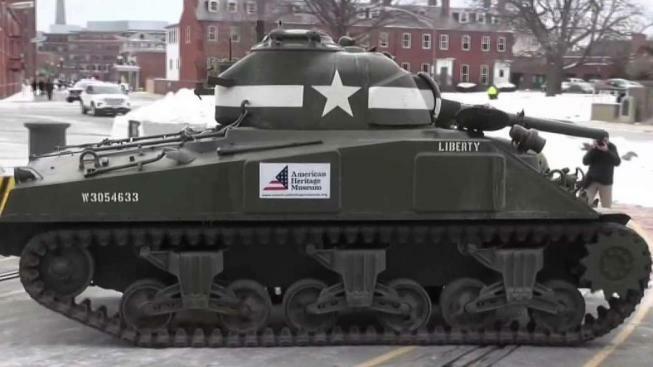 A veteran got to the chance to ride in the same tank he manned in World War II. The inside of a tank was Clarence Smoyer's home, and the crew was his family. Smoyer fought with the U.S. Army's 3rd Armored Division, nicknamed the Spearhead Division. In 1945, he defeated a German Panther tank near the cathedral in Cologne, Germany -- a dramatic duel filmed by an Army cameraman that was seen all over the world. Author Adam Makos tells Smoyer's story in the book "Spearhead," which was released Tuesday. Smoyer would made offhand comments to Makos about how he'd like to get aboard his old Sherman tank one last time. Makos started making calls and Smoyer started doing physical therapy, in case it worked out. Smoyer, who lives in Allentown, Pennsylvania, had expected a taxi to take him from his hotel to the USS Constitution Museum for a book signing Wednesday. Instead, he found a 32-ton Sherman tank from 1944 waiting outside. A huge smile flashed across Smoyer's face when he walked outside and saw the tank, saying it was a shock to see it. "That tank saved my life," he said. Smoyer was such a crack shot that his crew was given one of the Army's state-of-the-art Pershing tanks. That meant they would always go first into battle against German tanks that often were better equipped. Pershing tanks were rushed to Europe after the bloody Battle of the Bulge. "My tank commander, Bob Earley, used to smoke a pipe and when he'd go for a briefing in the morning, he'd come back and the pipe was jumping in his mouth," Smoyer recalls. "He was nervous because he knew we'd be leading and up in the front again." On March 5, 1945, Smoyer heard the company commander say over the radio, "Gentlemen, I give you Cologne. Let's knock the hell out of it." They charged into the city. "We pull out into the intersection and the driver saw the tank. We were looking right into the barrel," Smoyer said. "I fired once. Hit them. Sparks were flying. I fired another one, back more toward the engine compartment. I fired the third shot." Smoyer set the tank on fire so the German crew couldn't fire back. American forces advanced to the Rhine River. Smoyer and his crew were photographed victoriously climbing out of their tank. "Spearhead" is the story of how their lives collided. Makos organized the surprise tank ride to show his appreciation for Smoyer. "He did great things for this country and took great risks," Makos said. "Now we're giving him a last salute." It was a bit of a struggle to get in and out of the tank at his age, Smoyer said -- "It used to go a lot better when I was younger" -- but it took his breath away to see it. As for the book, he said, he hopes readers "understand what the fellows went through during the war. War is hell."